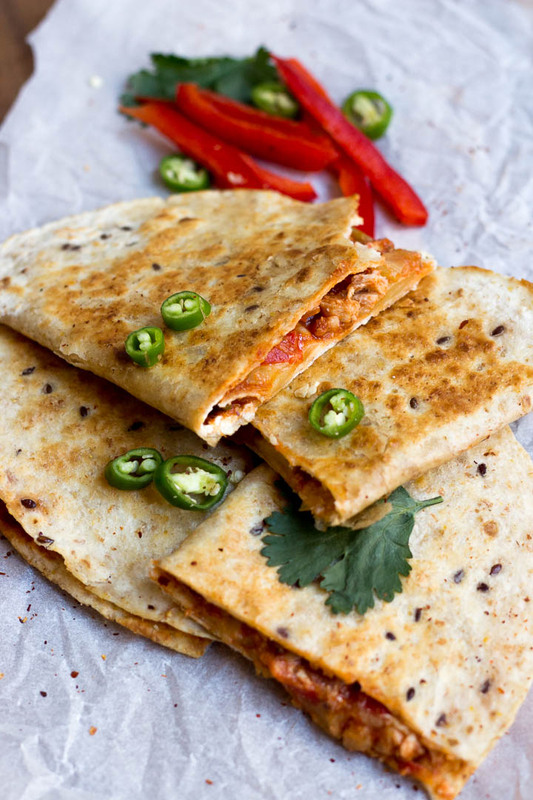 A Pakistani twist to a Mexican favourite, these desi chicken quesadillas are made with shredded chicken, sliced vegetables, lots of spices in a flour tortilla. 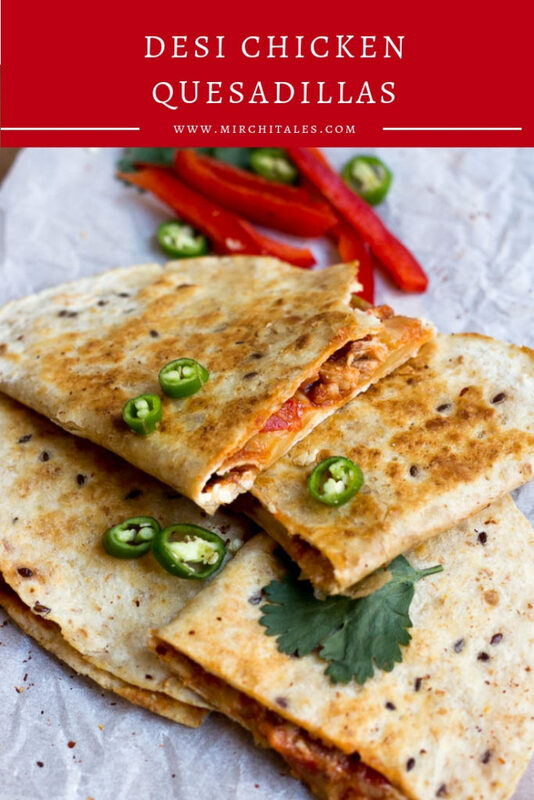 The recipe that I am posting today is a Desi twist to Mexican quesadillas hence the term Desi Chicken Quesadillas. It’s a recipe that my cousin Ambreen shared with me, or well, she made them for me and I absolutely loved them so then she shared the recipe with me. The recipe calls for making the chicken and tortilla from scratch, but it’s possible to use store-bought flour tortillas or leftover shredded chicken to make this recipe. In fact, if there’s leftover chicken salan, just wash the botis’, shred them up and add them in the mixture. 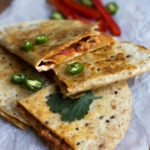 These desi chicken quesadillas can be served as a dinner with perhaps nachos and guacamole on the side. They can even be served as a snack with tea and biscuits. Mix flour, baking powder, salt and oil together. Knead while adding luke-warm water. Leave to rest for at least 10 minutes. Pinch off 1-inch diameter balls from your dough. Knead each of these into a tight ball by folding them over with your fingers, turning and repeating until it is shaped like a fat disk. On a lightly floured surface take one of the dough balls and begin to roll it out. Heat a frying pan or a skillet over medium to medium-high heat. Place the raw tortilla on the preheated pan and allow it to cook until it begins to puff up with air pockets turning turn the tortilla over with a spatula. Each side should cook for about 30 seconds – 1 minute, leaving the tortilla puffy. Cover with a foil or keep in a hotpot. Marinate chicken with lemon, salt and black pepper. Refrigerate for 20 minutes. In a pan, heat oil and saute minced garlic & ginger. When the garlic starts to brown, add marinated chicken and cook on high flame while stirring. Make sure the chicken doesn't get burned. Keep cooking till chicken is tender and the water has dried. When all water dries and chicken starts browning, add onions, capsicum and tomatoes and cook on high flame for another 30 seconds while stirring continuously. Turn the heat to low and add ketchup, chili garlic sauce, hot sauce, worchestshire sauce, red chili flakes, black pepper and salt. Mix well until everything in the pan is well coated with ketchup. Taste and adjust seasonings if necessary. Switch off stove. Spread cream cheese on the tortillas and spread chicken filling on half of the tortilla. Top with grated cheese, if using. Fold the other half on top (it should look like a semi-circle). Heat an empty frying pan, lightly brush the top of folded tortilla with some oil or butter and place in the frying pan, butter side down. While the quesadilla is toasting from one side, brush the other side too and flip. Once both sides are done, dish out, cut in 3 equal parts and serve immediately. I’m looking forward to this recipe.nice share and also nice making details. Much love, The spice tales. P.s. Julie & Julia is one of my favourite movies ever – do watch 100 Foot Journey and Chef as well!